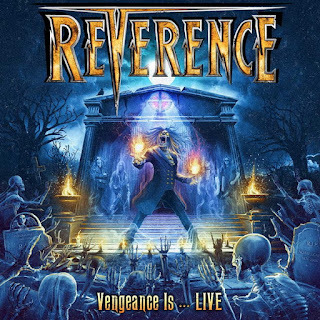 Δελτίο τύπου: «US heavy/power metal band REVERENCE is back with their latest offering, their new live album entitled ‘VENGEANCE IS…LIVE’! ‘VENGEANCE IS…LIVE’ is the brand new 15 song platter to be delivered to the masses on December 7th 2018 showcasing highlights from their previous three album such as the ominous ’When Darkness Calls’, classic ’Bleed For Me’, 'Until My Dying Breath' and ‘Angel In Black’, also includes the monster riffage of ‘Race To Obscene’... and never forgotten epic title-track ’Gods Of War’ as well as three brand new songs from their latest EP release, ‘Fire Lord’, ‘Phoenix Rising’ and the crowd chanting ‘New Order’. The disc also includes two classic covers, Iron Maiden’s ’Wasted Years’ and Savatage’s ‘Power Of The Night’ and finally closing the disc with the classic fan favorite ‘Revolution Rising’. The band is comprised of veteran members from many known-named bands. Scott Oliva (ex-Wind Wraith, Innerstrength, vocals), Steve ‘Dr. Killdrums’ Wacholz (ex-Savatage/Crimson Glory, drums), Bryan Holland (ex-Tokyo Blade, guitars), Paul Kleff (ex-Metal Church live, FireWolfe, guitars), Russ Pzutto (Twisted Sister live, Dee Snider, bass). Originally formed in 2010, REVERENCE, as their name describes, brings a sonic cocktail of classic era Savatage, Queensryche and Judas Priest with soaring vocals, brutal guitar riffage and face melting guitar solos in addition to the massive thunder from Savatage’s own original drummer ‘Dr. Killdrums’ behind the kit! 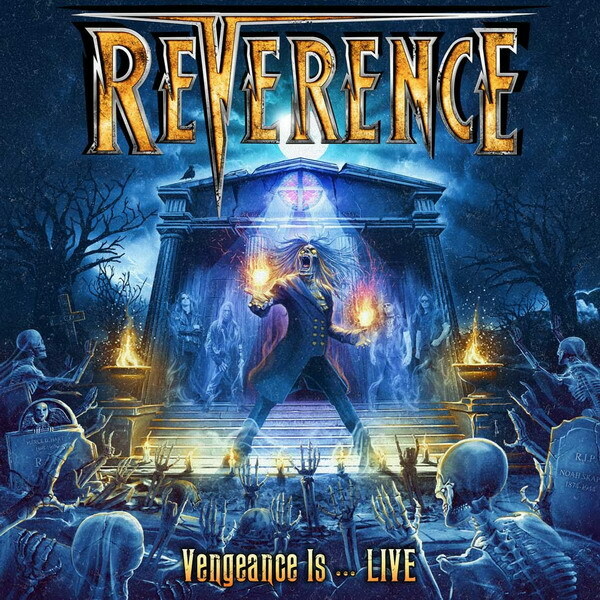 REVERENCE has released three highly acclaimed albums, their debut ‘When Darkness Calls’ in 2012 which immediately put the band on the metal world map, often being referred to as a ‘Supergroup’ from many press outlets and reviewers. They followed up with their second outing, the critically acclaimed ‘Gods Of War’ in 2015 which showed remarkable growth in their songwriting and musicianship within the band garnering again high praise from fans and critics alike. Vocalist Scott Oliva joined the band after the exit of current Riot V vocalist Todd Michael Hall in early 2016 and began writing for a new album. In early 2017 the band tragically lost guitarist Pete Rossi and decided to dedicate their next release, the long-running and dark-toned EP entitled ‘Foreverence’ in 2017 with new guitarist, former Metal Church live and FireWolfe guitarist Paul Kleff, the EP gave the band the opportunity to honor their fallen brother while giving themselves time to grieve. Video: "Until My Dying Breath"
• Featuring former, current and session live members of Savatage, Crimson Glory, Tokyo Blade, Metal Church, FireWolfe, Twisted Sister, Dee Snider. • All songs were recorded at various tour dates between 2013 - 2018, Mixed/Mastered between October 2017 - June 2018. Additional editing was completed at Black Pearl Studios between February 2017 - March 2018. • Songs 3, 7, 12 were written by: Bryan Holland and Scott Oliva. • All other songs were written by: Bryan Holland and Todd Michael Hall. • Artwork concept by Bryan Holland, Scott Oliva. • Artwork, Design and Layout by Stan-W Decker (Masterplan, Vanden Plas, Resurrection Kings, Stryper, Monument, Primal Fear). • Produced, mixed, mastered: Sid Garcia at Sight16Studios. • Co-Produced: Scott Oliva, Bryan Holland, Paul Kleff Arrangements: Scott Oliva, Bryan Holland. • Guest appearance by: Tony Rossi, drums. HEAVY METAL THUNDER 6 Δεκεμβρίου 2018 - 4:23 μ.μ.